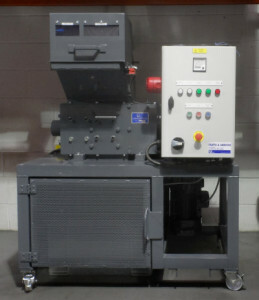 Glasgow Computer Recycling are pleased to announce that we have recently taken delivery of a Hard Disk Drive Shredder. This is a piece of specialised equipment that allows complete hard drives, mobile phones and backup tapes to be shredded to various sizes in order to meet UK Government IA5 Standards. Shred HDDs/hard disk drives to 6mm shred size – see the £1 coin in the photo! So whatever your requirement or policy contact us today and see how we can help you meet you Data Protection Act obligations when disposing of data bearing assets. We are happy to discuss your requirement in detail and work out the most suitable solution to meet your policies and budget. If you need onsite hard drive destruction services we can also provide this and the new hard drive shredder will increase our capacity for this as well. As always we can provide a Certificate of Destruction showing the serial numbers of all hard drives destroyed so you can prove they were processed properly. We will of course still provide our industry leading data erasure services which only use UK Government CESG approved software to securely and completely erase hard drives to clear them of all data and allow their safe and secure reuse. This new piece of equipment completes our service offering in the IT Asset Disposal industry and we are looking forward to putting it to use for our existing and new customers.